During an unusually hot summer for the Northlands, Noggin, Nooka and Knut are enjoying a walk when they come across the black, ruined castle of Nogbad the Bad. 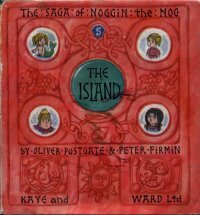 Although Noggin tells Nooka that Nogbad is no longer there, he points out the skulking crows that inhabit the castle who act as Nogbad's messengers. Eager to get away from the creepy castle and the crows, the three head carry on with their walk. As they head down to the warm beaches, they see in the bay a small horseshoe-shaped island covered in strange lush tropical vegetation and topped with a little hill from which a plume of smoke drifts. They wade across to the minute tropical island, and soon Knut is paddling by its tiny beach as Noggin picks a bunch of the purple fruit which he recognises as grapes, a stranger to the cool climate of the Northlands, for his wife. As Noggin and Nooka eat the grapes, Knut runs from the beach claiming he has seen people swimming under the sea, and shows his parents a small necklace of pink shells he has found, which he gives to his mother. After eating more grapes, the three feel tired and lie back on the small tropical island and sleep. Noggin is awoken by a chill wind, and gets up to see that the island is now in the middle of the cold sea - the Northlands are no-where in site! It appears that the only other inhabitants they now share the island with are the crows perched in a nearby tree. Noggin awakes Nooka, who then sees Knut looking into the volcano on top of the island, and calls him down at once. Knut tells his parents how there is a man inside the volcano, and as they investigate, they see Nogbad the Bad looking up at them, stoking a great steam engine. Noggin soon realises that the grapes they had all eaten had been bewitched, but Nogbad only laughs in the face of Noggin's anger. Looking around, Nooka finds a jagged stone and carefully throws it down into the works of the steam engine, which, with a grinding shudder, comes to a stop and Nogbad, despite his efforts, is unable to start it again. As the pressure in the boiler climbs, Noggin grabs Nooka and Knut and they flee for the furthest corner of the island, and arrive just in time as Nogbad is shot from the mouth of the volcano amidst an explosion of steam and machinery. Noggin dives into the sea, and soon pulls the drenched Nogbad back to the shore. No sooner is Nogbad safe, when he pulls two bunches of leather straps from his tunic, loops them round his wrists and calls upon his crows, who lift him by the straps and fly him off to claim the crown of the Northlands for himself. Deserted and alone on the island, which is now cooling without the warmth from the steam engine, Noggin makes a shelter for his family and they settle down for the night. As the cold morning dawns, Knut suddenly remembers the people he saw in the sea earlier and runs to the beach, returning shortly afterwards with a wooden pushchair, in which sit two shivering mermaids, one of them wearing a necklace of pink shells. Noggin and Nooka great the mermaids, and Nooka returns the necklace that Knut had found earlier. They build a fire to warm the mermaids, who explain that they could sing for help, but the sound of mermaids singing would rive mortals mad. However, one of the mermaids suggest a lullaby to send the Nogs to sleep first, so after the Nogs quickly succumb, the Mermaids change to a stranger song. And soon their call is answered. The see comes alive with every form of sea life imaginable, who mass around the little island, and are finally joined by Arup, the legendary king of the walruses. After hearing the mermaid's tale, he barks orders to his fellow sea-creatures who begin to nudge the island southwards, as Arup speeds on ahead. Back in the Land of Nog, Nogbad is addressing the Council of Elders by the bay. With one of Knut's sandals held high as proof, he tells of how the royal trio have perished and that he is now king of the Nogs. As the Elders start to mourn, a great eruption from the water soaks them as Arup emerges and thwarts Nogbad. Only a short moment later, a lookout on the bay shout a rather unusual "Land Ho!". The puzzled Nogs all look out to sea, to see the small island being nosed into the harbour by a score of walruses. In the Nogs delight, Nogbad once more makes his escape. The Nogs welcome the mermaids, and keep the warm until Olaf the Lofty is able to mend the island's boiler, allowing the mermaids to live very happily in their centrally heated lagoon.